News that Omar Khadr would receive an official apology from the Canadian government along with a $10.5 million settlement of his civil suit elicited the predictable outcry from the Canadian media. Journalists and commentators questioned the wisdom of the decision and the amount of the settlement, and the narrative that has now taken form is of a convicted terrorist winning a taxpayer-funded lottery at the behest of a naïve prime minister. The press has not simply questioned the wisdom of the apology and settlement—it has ignored or obscured the relevant facts that made an apology and settlement necessary in the first place. Opinion writers and pundits seem entirely uninterested in what, exactly, Khadr endured during his detention at Guantanamo Bay, and who he became afterwards. Omar Khadr was fifteen years old in July 2002 when he allegedly threw a grenade at U.S. soldiers, killing Sgt. Christopher Speer. I say “allegedly threw” because the precise facts of what took place that day in the firefight have never been conclusively established: From 2002 to 2008, the official U.S. government story was that Khadr was the sole survivor in the compound after it had been bombarded and shot at—by inference, only Khadr could have thrown the grenade. In 2008, however, a report from the only witness to the firefight was inadvertently released to reporters. In it, the witness claimed that there were two men in the compound. The official government theory was weakened further when it was revealed that Lt. Col. Randy Watt, who had led the American battalion, wrote a report after the firefight describing how the grenade-thrower had been killed in battle. The report was later “updated” to state that the grenade-thrower was shot, not killed. Of the 780 detainees held in Guantanamo since 2001, 731 were eventually released without charges—often after a decade of incarceration. The Canadian press has forgotten all of this, or perhaps they remember it but do not think it relevant. What about torture? At fifteen, Khadr was taken to Bagram Air Base in Afghanistan where a bag was placed over his head. He was ordered to stand for hours. Dogs leapt at his chest. 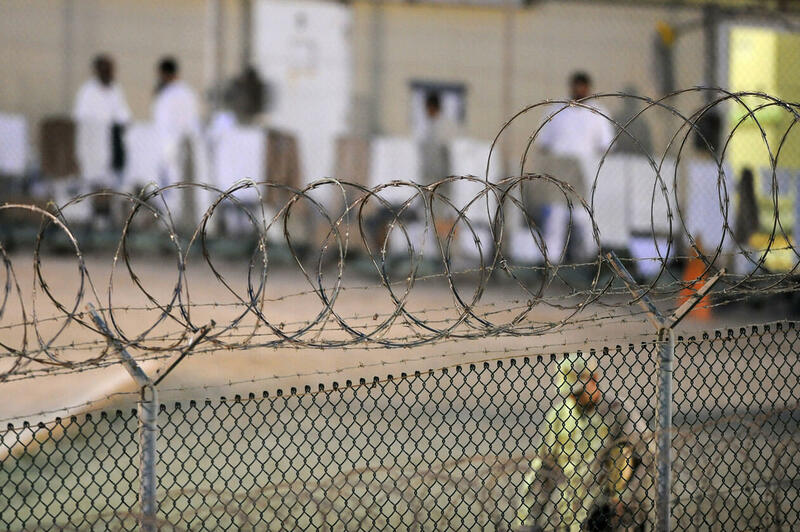 At Guantanamo, and still a teenager, Khadr urinated on himself. The guards poured pine oil on him and dragged the shackled boy through his own piss, using him as a human mop. Khadr was sixteen when Canadian security officials interviewed him at Guantanamo, and then illegally turned over the intelligence to the Pentagon. “Promise me you’ll protect me from the Americans,” the boy said to the representatives of his government. And then he showed them his scars. He cried for his mother. He was beaten, choked, deprived of light, deprived of sleep, forced into harmful stress positions. Guantanamo guards threatened to deport him to Arab countries like Syria where, they claimed, he would be raped by other men. All of this was done to a Canadian teenager, with the Canadian government’s full support. Under duress, Khadr eventually pled guilty. He agreed to the facts as presented by the Military Commission because he and his lawyers concluded that fighting an unjust system without due process or adequate protections for the accused was an unwinnable battle. Khadr can therefore be called a “convicted terrorist,” but not asking how that “conviction” came about is irresponsible at best, unethical at worst. So this was the context of the $10.5 million settlement: A child soldier who allegedly threw a grenade at U.S. forces (or didn’t), who was held for thirteen years in an offshore detention center, who was repeatedly abused and tortured with his government’s assistance, whose Charter rights were violated, whose entire youth was spent in chains. Khadr asked for an apology and restitution. He has been treated as though none of this happened, as though he was just a spoiled child who should feel lucky he’s still not in GITMO. The press seems to think that reparations for Khadr’s maltreatment are a bonus that he does not deserve. But this is not about bonuses or windfalls. It is about this country’s past sins, and the moral necessity of acknowledging and atoning for those sins. That’s what enlightened, self-professed democracies do. The saga of Omar Khadr, however, has never been about law or even policy. It’s been about how we see the crimes of people who do not look like us, and are therefore treated as conditional citizens. Radio host Charles Adler said Khadr was “technically a Canadian”—as if citizenship was subject to technical whims. Margaret Wente opined that “If there is a victim here, people feel, it’s not Mr. Khadr.” John Ivison wrote that “Khadr’s reputation is now tinged with the grubbiness of what many will consider unjust gain.” Who are the “people” and the “many” that Wente and Ivison are ventriloquizing here? They are the Canadian public, who along with the press, do not yet have the moral imagination to countenance that maybe—just maybe—Khadr was also a victim here. A basic empathy gap has always existed between Canada and Khadr. The minute the label “terrorist” is slapped onto someone—regardless of their age, their circumstances, or even the facts—we begin thinking with the blood. We rush to violate our most sacred principles at the first whiff of anger. Our memories of others’ crimes are always long and detailed, while our own faults are extinguished with the legitimizing elixir of moral superiority. It might feel good to denounce Omar Khadr. It might be cathartic to condemn him as a confessed terrorist. But the rights of citizenship are not abrogated because a citizen has committed a crime. They are not abrogated because the government thinks you have no place in society. Those rights exist to protect all of us, especially the vulnerable. After everything that’s happened to him, Khadr is prepared to accept the ills of his past. Perhaps Canada might do the same for its own recent history. Correction: An earlier version of this story misspelled the name of columnist John Ivison. The Walrus regrets the error.